“I WEAR YOUR GRANDADS CLOTHES, I LOOK INCREDIBLE”……..if you don’t know that sentence then where have you been?! If you haven’t heard of Macklemore, take yourself to YouTube and search that because once you hear him you won’t forget him. 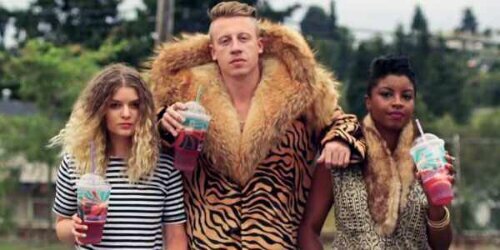 Macklemore is a rapper from Seattle who managed to grab his first number one single with this song ‘Thrift Shop’. For those of you who don’t live in America and don’t know what a thrift shop is then let me enlighten you. A thrift shop in the US is we like to call a charity shop in the UK and a give way store in other countries. I had never heard if Macklemore before so I had no idea what he was about all I knew is that he is gorgeous to look at (in ny opinion). Like I said before he’s a rapper from Seattle who consistanly works with Ryan Lewis on a multiple of songs. I absolutely love love loveeeeeeeeee this song and everytime it comes on I can’t help but song only to the chorus. I love the fact that he wears his grandads clothes and you know what he does look incredible (yes pun intended). I had to give this song, song of the week. I just had to. So if you haven’t heard the song then check out video below. If you don’t know or have never heard of Gangnam Style then you haven’t lived! PSY’s hit anthem Gangnam Style has been taking over the entire world. This catchy South Korean song has become YouTube’s most liked video of all time and has more than 330million hits on YouTube. It’s uncertain what PSY is actually saying in the song however at this point I don’t really care! The song is so catchy and amazing. You can’t help but say ‘GANGNAM STYLE’ when the song comes on the radio or on TV. Of all the things that fascinate you with this song, you have to admit the dance move is even more catchier than the song! The horse riding movements and the swishing and swaying to the side completes the whole combination with the song. When I first heard this song, I have to admit I thought I was just some stupid pointless song like Crazy Frog that made no sense. After like a week or so, I started to warm up to this song. My vocabulary has added one more phrase to it…….GANGNAM STYLE! I really like this song and I reckon 330 million people like it too. I’m taking it old school this week. I have decided to give Song of the Week to The Fugees for there 1996 hit Ready or Not. Earlier this week, I was going through my mum’s old CD collection and came across The Fugees album ‘The Score’. I decided to play it just to reminisce about them old school hits and ever since then I haven’t been able to get the songs out of my head. The song that stuck in my head the most was Ready or Not. I was 3 years old when the song got released but I remember growing up and hearing The Fugee records being played in my house. Over the last 2 days I have been attempting to learn the rap just so I can sing along. Cheesy…yes I know! I miss The Fugees. I actually do. They made such peaceful and real music. I feel like there music will always live on because of the fact that they were different and kept true to themselves. Lauryn Hill is so so so talented with her R&B vocals and Wyclef Jean and Pras added that element on hip hop to the group. Songs like Fu Ge La and Killing Me Softly will forever live on. That’s why I have chosen to give The Fugees – Ready or Not Song of the Week. Oh how I love it when I am proved wrong which seems weird to most people but who cares. Little Mix have proved me wrong in so many ways. I honestly thought nothing of them when they were on The X Factor. During the competition, I couldn’t stand them. Me being the bias biatch that I am I personally believed that they were going to be a huge flop like all the other girlbands on The X Factor. However I was proven wrong. Little Mix have suppressed the stereotype of the X Factor producing flop artist by gaining a second number single within 10 months! There current number one single Wings is giving me so much life at the moment. I must admit when the song comes on MTV I don’t turn over the channel, in fact I do the complete opposite by clapping my hands and singing along! I really like this song and I’m starting to like Little Mix as a group as well. Shame the same can’t be said for The Saturdays. This week’s single of the week is Little Mix with Wings. Congrats on the number one girls! Song of the Week this week is going to Sam and The Womp – Bom Bom. I first saw the video for this song 2 weeks ago and when I first saw it I thought it was Bjork because the leader singer in the video generally looks like Bjork! I have to be honest and admit I had no interest in the song when I first heard it but I decided to give the song and chance and listen to it and ever since then I can not stop saying ‘BOM BOM BOM’!!!! Besides those three words I generally don’t understand what the hell she is saying in the song so I just make up my own lyrics. But that’s strangely what attracts me to the song; the simple fact that I don’t know what she’s saying or what a BOM BOM is; I find quit appealing. If you haven’t heard this song or seen the video please check it out below. Trust me you are going to love it!!! BOM BOM BOM Style LOL!